The Food and Drug Administration approved Amgen’s Kyprolis for second-line treatments of multiple-myeloma on Friday. 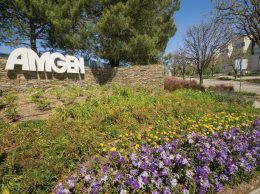 Thousand Oaks-based Amgen’s new treatment for multiple-myeloma could pay off big for the company now that the treatment can be accessed by more patients in the second line of treatments. Kyprolis was approved for third-line treatments in 2012. The FDA’s approval comes less than a day after Amgen submitted additional data to the FDA about Kyprolis’s possible benefits as a second-line drug. Multiple-myeloma is a blood cancer that forms in plasma cells and typically grows in bone marrow. According to the American Cancer Society, 27,000 Americans will be diagnosed with multiple-myeloma in 2015, and 11,000 will die from the disease. The National Cancer Institute said there were 90,000 Americans living with the disease in 2012. Kyprolis works by preventing the breakdown of proteins in cancer cells, which cause the cancer cells to die. It was the cornerstone of Amgen’s $10.4 billion buyout of Onyx Pharmaceuticals in 2013. “The expanded indication of Kyprolis provides patients with relapsed multiple myeloma a new therapeutic option, helping to address a real unmet need for this common blood cancer,” Sean Harper, executive vice president of research and development at Amgen, said in a news release. Normally, the FDA takes 10 months to approve drugs or treatments for new uses. On March 30 though, the FDA announced it would use its expedited approval process, which can approve new treatments in as little as is six months. Like many recent Amgen drugs, Kyprolis has been criticized for its high cost because it typically costs $10,000 per 28-day cycle. The FDA approved Kyprolis using data from an Amgen study whose results were announced in December. The data showed that patients treated with a combination of Kyprolis and two other drugs lived 50 percent longer without their disease worsening than patients just treated with the other drugs. Amgen will study the benefits of Kyprolis as a first-line treatment in its new CLARION study.